These drivers will influence differentiation strategies in the years ahead, and several additional factors will drive differentiation programs. First, in this era of engagement where power increasingly shifts to the individual, personalization becomes critical: the often talked about segment of one will attract much enterprise attention over the next decade. In addition, as the number of connected devices increases, old sources of competitive advantage will shift to new ones. Second, given the rapid shifts in business and market conditions, flexibility in operating and business models is emerging as a key differentiator. Business agility continues to lead the list of those characteristics that enable success, and companies that effectively deliver business model innovation increase their chances of creating competitive advantage. Third, a new battleground for differentiation is stakeholder experience, and this requires companies to deliver consumer-like experiences across the ecosystem (customers, employees, partners, other stakeholders). Understanding that an ecosystem delivers the intended experience is significant to the transformation program, and the stakeholders within that ecosystem must participate. Fourth, differentiation increasingly requires shedding non-core functions and specializing, making outsourcing a key piece of future road maps – back to the virtuous cycle described by Mr. Moore. Although the outsourcing term can evoke a negative response these days, this is simply a function of focus. A relentless focus on what we do best (specializing) is a key to future differentiation strategies. 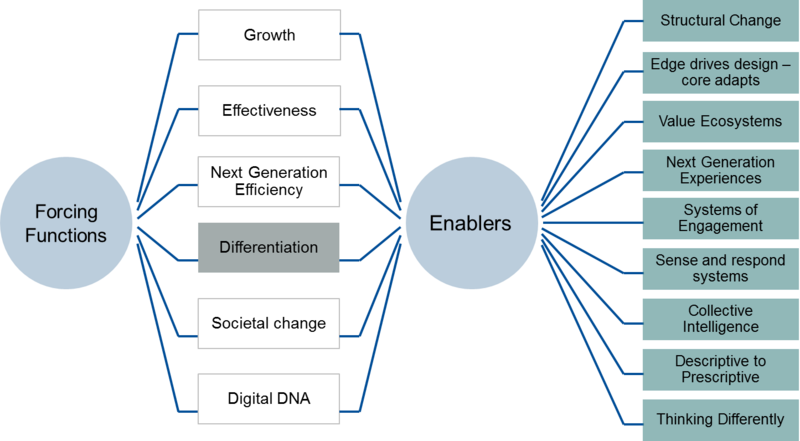 Fifth, differentiation will require the alignment and seamless execution of the value ecosystem. As described earlier in this series, value creation (and therefore differentiation) increasingly involves the contributions of an ecosystem. That’s a look at the differentiation forcing function. The critical need to differentiate and the ineffectiveness of traditional methods of differentiation are drivers of enterprise investment in a future state. The next post will focus on the societal change forcing function.